TBF Nick it’s been another fail of long range modelling again this winter . I applaud those who produce long range forecasts; they often put a lot of hard work into their posts, place their neck on the block and are far too often decapitated. As a result, some unfortunately take their efforts elsewhere. It's worth differentiating between probabilities and exact outcomes. A split in the TPV looks probable, but not guaranteed (unless I've missed some information). 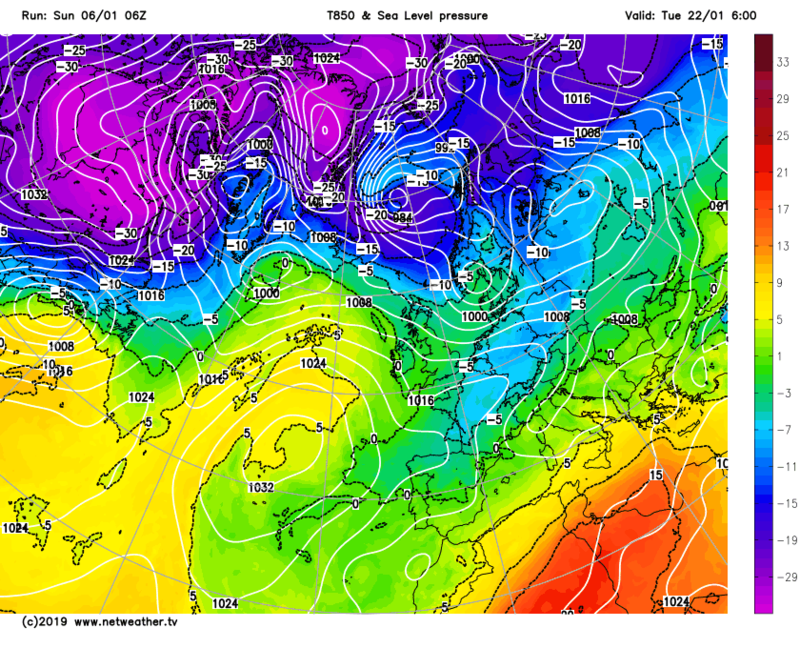 If this does happen, then it increases the likelihood of cold air dropping south and affecting the UK. The SSW has not yet propagated down to the Troposhere and until (or even if) it does we cannot be sure of the effect it will have on our weather. At the moment, the models are starting to play around with various scenarios based on hugely complex interactions through multiple levels of the atmosphere, so is it any surprise we are seeing swings in the latter stages of output? Most LR forecasters I've read are based on the SSW impact. Until we see the effects we cannot judge accuracy and even if they are wrong, its a learning process based on a huge effort which is largely unrewarded and even criticised. From stonker to stinker: That's FI for you! 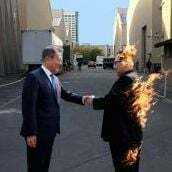 I think what will really happen is this. The high over the UK is like Juliet on the balcony waiting and waiting to link up with its Romeo, in this case a high pressure over Scandinavia. Just when it looks like its search as been all in vain, Romeo suddenly appears out of the blue, confounding all who could previously see no sign of it developing in the models. They meet up and make mad passionate winter for the next two months! Mods you might as well just put this thread bk to model chat and we can all keep Knocker company. Because to say It gone of the rails is an understatement. Seems pointless in being called Hunt for cold. Few suggestions, Crystal ball, I have a hunch thread, Winter is over bring on the Summer thread. Good grief. The moderators in this thread really have the patience of Jobe. Some of the gfuqhgfpjhing, sniping and downright childish responses to reasoned posts are more fit for kindergarten yards. Back on thread, It has constantly been said that just after mid month is when we would see the response effecting our neighborhood from the SSW, The ECM only goes out to the 15th today, the GFS, shows what is possible after mid month. I’m not saying the GFS is on the money, but please, can we all just keep the toys in the pram? It’s becoming quite tedious in here. I think that there has been an initial response to the SSW with cold covering most of E.Europe and anomalous cold uppers in N Africa. It would appear that the UK has missed this early cold and is in the milder sector! The clock is ticking on the SSW and I think some are frustrated that early doors we have missed out, and now going forward a waiting game for 2 weeks with plenty of extreme cold missing us to the east. No one knows the length of this event and whether or not missing out early will be a sign or just a delay? We can be a glass half full but those looking at it the other way have a point! I really don't understand all the negativity, surely some cold zonality is better than all the predominantly benign mildish dross coldies have endured so far this winter?? ?..I'm seeing some increase in wintry potential in the outlook..surely something to celebrate? Nooooooo please keep it...it's making me laugh so much...more so than the actual weather! Just to remind you all there is a more casual thread for non model chat in the banter and moans thread. Honestly, just post in there rather than clogging this thread with chit chat and vague statements grasping at straws. In 2013 we had a initial response which gave that massive snow event on I think the 18th of January but we also went very cold in March so not all is lost but I still think by the end of January it will be cold. Back on thread, It has constantly been said that just after mid month is when we would see the response effecting our neighborhood from the SSW, The EC﻿M﻿﻿﻿﻿﻿﻿﻿ only goes out to the 15th today, the GFS, shows﻿﻿ what is possible after mid month. Let’s just get this straight , I would never put down the very very knowledgable people who do long range forecasts on this forum , I love all of there input . From @Steve Murr @bluearmy @Glacier Point@Catacol and many many more It’s what makes this forum great . I was more saying the LR models ala EC46 has been showing wintry outputs but really never getting no closer than 3 weeks away . The same with the meto updates witch are half based on th EC46 . Hi Frosty, you've been banging the cold zonal drum for a while, and it does look from the model output you will get your wish, for a while. But I really can't see the attraction, maybe it's a location thing? The chances of snow in Oxfordshire (for example - don't want to get too IMBY!) from such a set up is zilch! My take on the morning runs is that we have 10 days of further dross to get through, but beyond that then the wintry charts will start to show as the SSW begins to have an effect that impacts the UK - at the moment it doesn't, the only noticeable feature from it in the reliable modelling is the Arctic high and that's not affecting us at the moment. GEFS zonal wind charts today again show a prolonged reversal in the strat - this must make its impact felt more strongly soon, and possibly for an extended period thereafter. Like others have said, patience is the watchword. Edit - would help if I actually included the chart, lol! 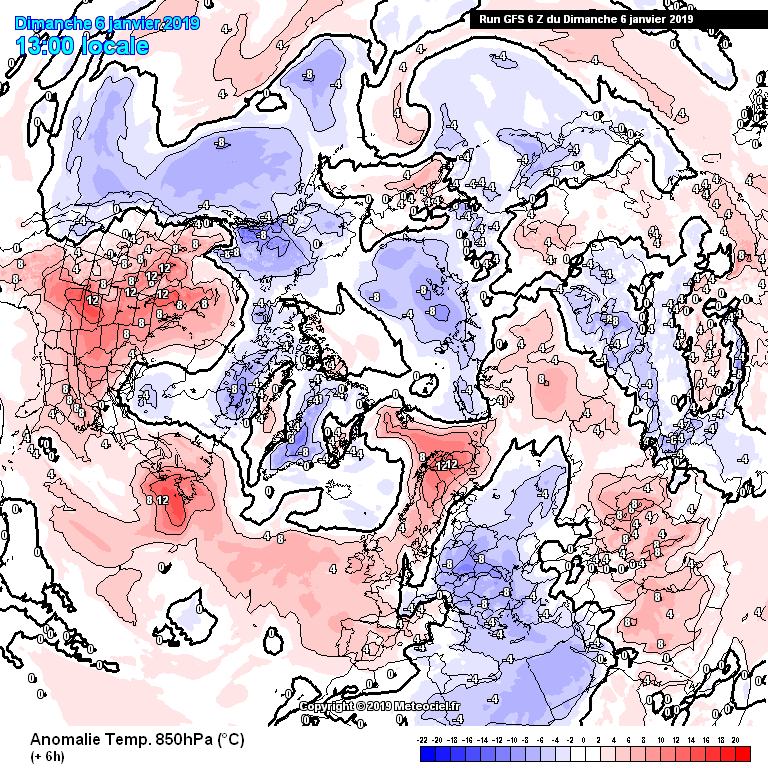 The ECM only goes out to the 15th today, the GFS, shows what is possible after mid month. ECM at day 10 though says no to any cold spells for at least a further 5 days down the line if you look at the NH profile. 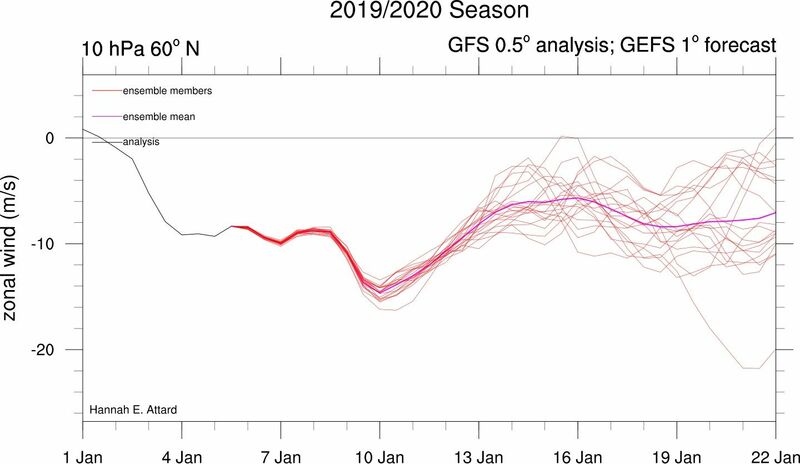 GFS out towards endof the month doesn’t show much promise either, so it’s not outrageous to suggest that the wait / hunt will probably go on into Feb ? TBF Nick it’s been another fail of long range modelling again this winter . We have had promising signs for a good wintry spell of weather since November and we have seen zilch . Nothing really for the next 10 days at least . February will soon be knocking on the door it’s so annoying . The meto updates have been looking brilliant but wintry weather has never come closer . The EC 46 had stunning output for jan , again never got any closer . This is not a winters over post but would of been good to have a late December and January cold and snow for once and all the signs were looking so great from everyone . So it’s so disappointing to still not of had any wintry weather so far . 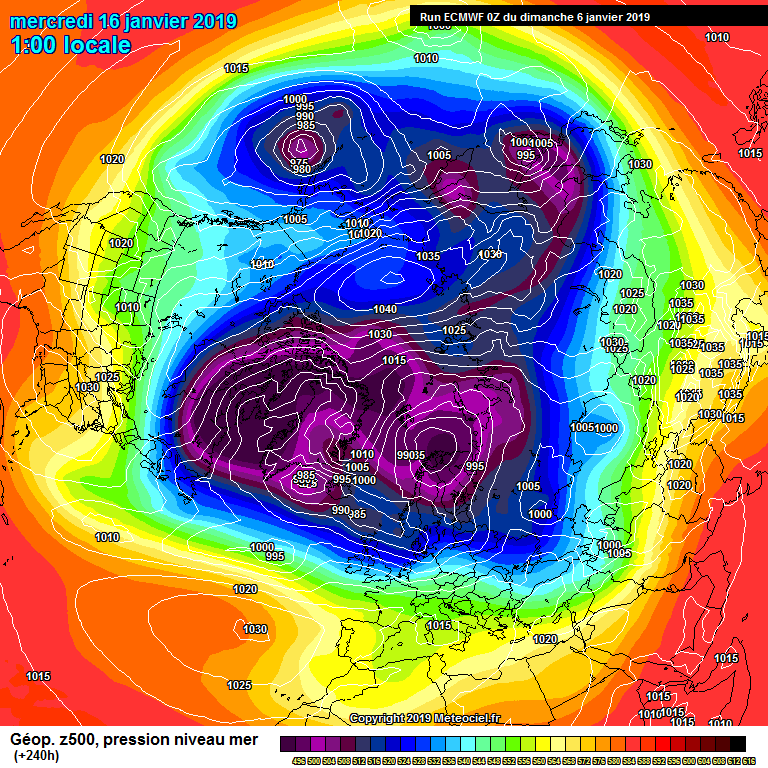 if winter does onset between the 20/1 and 30/1, then the ec46 could never be dissed again! Indeed pete, I'm happy to say there's no downgrade from exeter and the GEFS is still indicating an increasing chance of wintry weather..thank gawd there is an end in sight to the predominantly vile boring pattern we have seen so far this winter!! !..model watching should become more interesting from now on!! For me please keep the hunt for cold forum . I think over the next several days we will start to see some really good charts appearing, not a hunch, but a gradual process bringing much lower 850 mb temperatures south , and possibly STORMY conditions, for me this is a start in the right direction and it's only January 6th , I'm excited ,STELLAS and Sausage naps with brown sauce are on me ,think I meant Naps, damn BAPS .CHEERS . My take on the morning runs is that we have 10 days of further dross to get through, but beyond that then the wintry charts will start to show as the SSW begins to have an effect that impacts the UK - at the moment it doesn't, the only noticeable feature from it in the reliable modelling is the Arctic high and that's not ﻿affecting us at the moment. With respect, if that chart verifies in 10 days, it will be a miracle. You’re missing the point of my post! 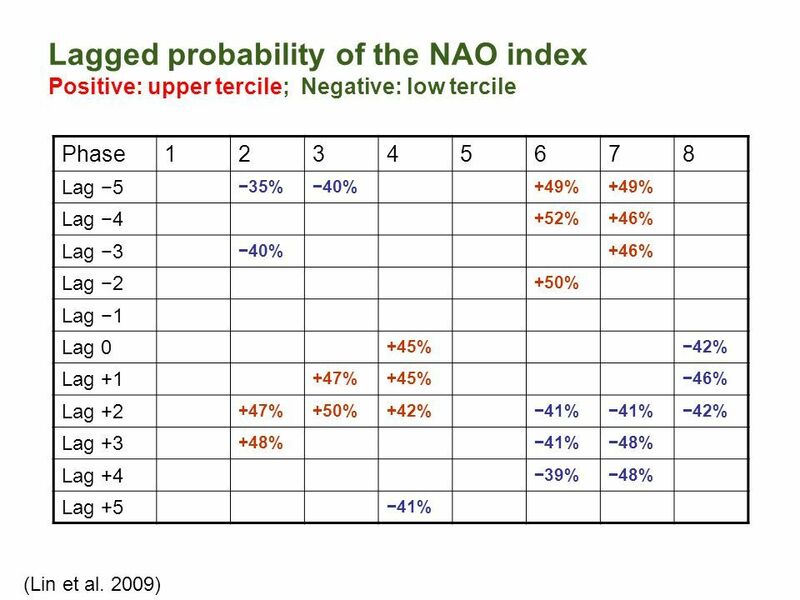 @Snowy HibboI have considered this chart as an indicator of NAO MJO LAG, which according to me shows only few days lag. 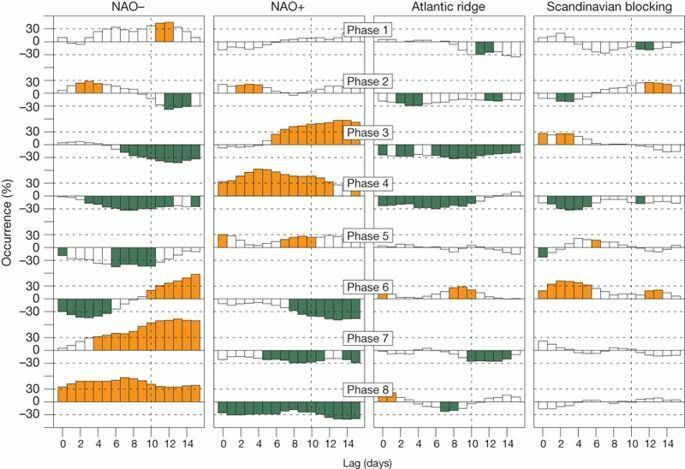 phase of the NAO is decreased (increased) about ten days after the MJO is in phase 3 (phase 6)." To point to a few days lag is just wrong. We were in phase 6 from 1 - 3 Jan (given peak lag impact of 10 days this would mean -NAO signature evolving 10-13 Jan) and entered phase 7 thereafter which we know has the most favourable impacts on Greenland blocking. Unfortunately for MJO followers the forecast of several days in phase 7 would appear to have been incorrect, and it may be that phase 7 is bypassed within 48 hours of initiating. In fact transition through 6/7 has been particularly fast which a few days ago was not on the cards. However, given phase 7 lag peaks of past 14th Jan we can assume that mid month will be the peak of MJO forcing and we are hoping to see downwell impacts of the SSW at about the same time. Sounds simple enough - though the extra tropical factors in GSDM theory lie outside of the MJO as a single factor, and the nature of the ongoing SSW is certainly wreaking havoc with modelling and predictions. I hope people on here are trying to learn about these processes as much as they are hunting gold plated charts - and learning for me doesn't equate with moaning when things don't sit right. Those who wish to moan are best doing so to the mirror. 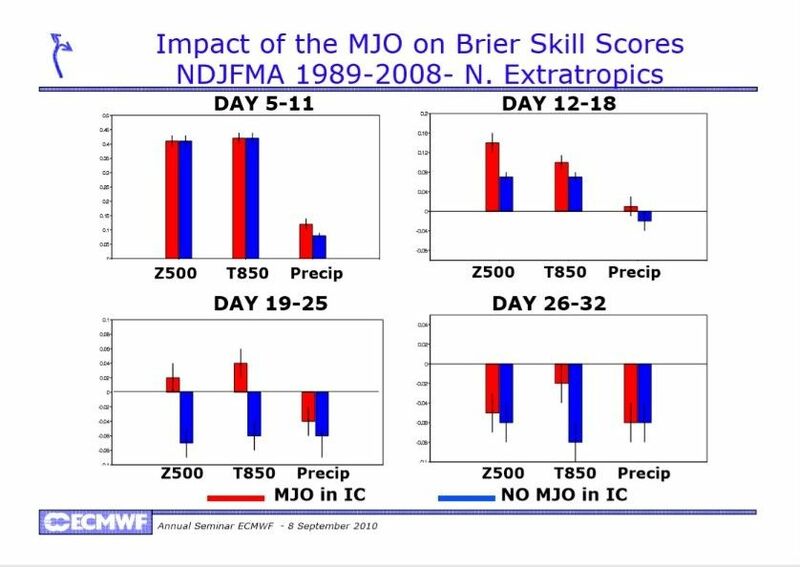 From a learning angle the sense that the MJO acts in lag times of a few days is wrong, both from evidence of past events and also common sense. 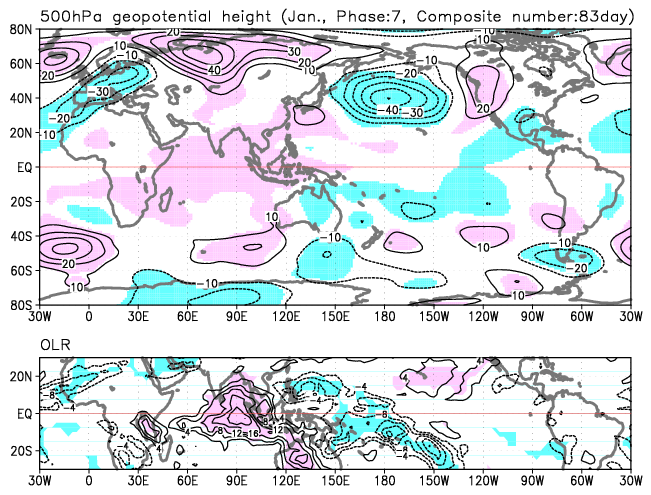 How could a tropical signal in the equatorial pacific change pressure patterns in the north atlantic within 96 hours? Equal numbers of mild and cold members generally with no clear direction. Getting the cold into the semi-reliable doesn't seem to want to happen yet. 2013 when it was like a rat up a drainpipe, this year that rat is an elephant and it ain't getting any closer. You can't get an elephant up a drainpipe. Fair enough, and it wasn't a dig at yourself! But we have to remember that we are still very much at the experimental and theoretical edge of knowledge when it comes to forecasts beyond a couple of weeks (some would say beyond five days!) and some of the things we have learned over the past few years would have seemed utterly inconceivable just five years ago. For the moment we have to accept that forecasts beyond a week cannot offer much more than probabilities of an overall pattern based on an imperfect set of inputs. Last year's forecasts following the SSW were the best I've ever seen (I remember following the BFTE from as far out as three weeks based on the musings of the knowledgeable members on here), and even then we still had variations in the NWP models. 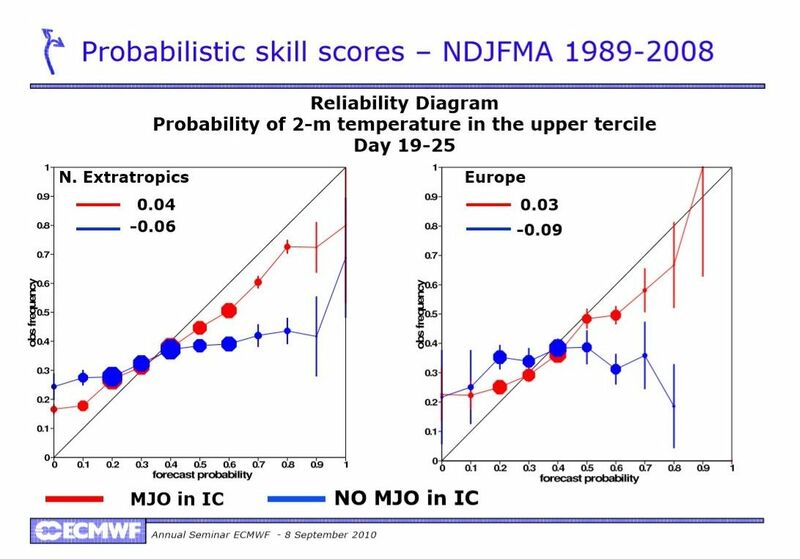 We will never have perfect information being input and the current setup introduces huge new and rarely modelled complexities to the NWP models. All we can be sure of is that at some point the pattern will change; probability seems to favour an outbreak of cold at some stage, indeed GEFS ensembles are hinting at just such a change. I'll sit back and enjoy the ride!